The Thundershirt is a pressure wrap, meaning it exerts a firm yet comfortable uniform pressure on the body. It calms dogs in the same way swaddling calms infants. According to the manufacturer, a survey of users showed that “over 85% percent of dogs showed significant improvement in at least one anxiety symptom when using Thundershirt.” It can help calm dogs who are terrified of thunder, nervous about nail clipping, or anxious when left alone. It can allay other fears as well, including sounds, riding in the car, or being outdoors. It can even help dogs who are “hyper” to settle down, and easily distracted dogs to be calmer in a training environment. 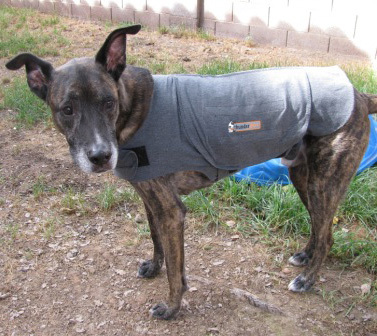 Although the Thundershirt may be used as part of a behavior modification program, its effects are normally seen within minutes, with no training or behavior program necessary. Dogs acclimate to the wrap very quickly, and many visibly calm right away. Some even settle down and go to sleep. The Thundershirt is made of a soft, comfortable material, and the Velcro closures and overall design make it fast and easy to apply. Please refer to the sizing chart to order the right size for your dog. To determine the right size for your dog, please see the table below. “Chest Size” is the best measurement to use. Simply measure right behind your dog’s front legs where the chest is largest. Thank you for so quickly getting the shirt and book to me, I was shocked when it arrived yesterday afternoon. I can't tell you how much I love that shirt! We put it on Nelson and watched his pupils contract, then he settled and was asleep on his back, paws in the air, inside 10 minutes! This, from the dog who grumbles and cries in front of our other male every time he walks in, and it all took place with them 5 feet apart. I can't thank you enough. I still can't believe it though. It is far more effective than the equi fleece, and he simply luxuriates in it! Its spooky almost! Awesome! I will be recommending this to all my fearful clients. What a great product!